I have in recent years been privileged to work in colaboration with Martin Mittelacher, an expert on the role of the Nassau troops in the Waterloo Campaign. I am therefore very proud to republish here, a copy of an article originally published in the Journal of the Society of Army Historical Research (JSAHR) Autumn 2003, with his permission, to help get his message across. Descriptions of the Battle of Waterloo are in some places quite contradictory, particu­larly with respect to time and troops involved, and no less so in regard to the action around Hougoumont, that strongpoint in front of the right of the allied line. But there is near-unanimity in British accounts about the negligible, if not infamous, role of the Nassau battalion posted there on the morning of battle. On the other hand, a diligent examination of both British and German sources reveals the Nassauers anything but minor role in preventing the enemy from storming Chateau Hou­goumont in his first attack, and in later phases of the Battle. Their contribution to its defence has been treated with silence in most English-language accounts, primarily, it seems, so as not to detract from the heroism of the British Foot Guards in this battle within the battle. But in fairness to those Nassau soldiers, and in the interests of historical truth, their part in the contest for this strongpoint deserves to be described in appropriate detail. Certain myths about the Nassauers conduct at Hougoumont have survived in biographies and battle histories to the present day. Some of these have their origin in occasional remarks of the Duke of Wellington. When telling a good story it seems the great man was not always too particular about his facts. Following is an example of how a Wellington anecdote changed over the years into a bona fide historical event. Hooper, the historian, had changed salient points of the original anecdote (see Appendix) to enhance its credibility—reducing the ‘brigade’ of Nassauers to a regiment, and posting them in a forward position at the edge of the wood, 300 yards from the French, instead of in the Hougoumont orchard of the anecdote, about 600 yards distant from the French lines. The French were no more than 300 yards away and in heavy strength; the Nassauers appear to have been on the point of panic when Wellington rode up to them and to some extent restored their morale. As he rode away, however, some of them shot at him. But this record of events suffers from a fatal flaw: the incident never happened. Briefly, of the Nassau battalion detached to Hougoumont only its light, or voltigeur, company of some 130 men was posted at the edge of the small wood facing the French, next to about 330 Hanoverian riflemen. Another Nassau company served as support further back in the wood.3 So, as the story goes, it could only have been a single Nassau company that was about to take flight and was harangued by the Duke, with some of its men sending a few shots after him as he rode off, all this commotion going unnoticed and unreported by its Hanoverian neighbours. In the following, an attempt is made to sort fact from fiction about the Nassauers part in the action at Hougoumont. Let us begin with a brief description of the background of these troops. The Nassau unit detached to Hougoumont was the 1st Battalion of the 2nd Light Regiment Nassau. Most of the officers and many men of that Regiments rank and file were battle-hardened veterans of Napoleons Spanish War. Their Duchy of Nassau, today a part of the German State of Hesse, was one of the Emperors creations, made up from the former Principalities of Nassau-Usingen and Nassau-Weilburg. The Duchy had contributed some 3500 men to the French army in Spain. As Napoleons fortunes waned after the Battle of Leipzig in October 1813, the 2nd Nassau Regiment went over to the British side at Bayonne in December that year. Wellington sent the men to England to join in the war against Napoleon. The 2nd Nassaus eventually became part of the Netherlands Army and, with the Orange-Nassau Regiment (28th Netherlands Line) and a volunteer Jager company, formed Prince Bernhard of Saxe-Weimars 2nd Brigade of the 2nd Netherlands Division. Having fought the French at Quatre Bras, all the Brigade except for the 1st Battalion of the 2nd Nassau Regiment took position on the morning of 18 June in the Papelotte area, on the extreme left of the allied line. Between nine and ten o clock that single unit was led by a staff officer before the front of the line to Chateau Hougoumont, in order to reinforce its garrison of British Guards and Hanoverians. The following account concerns itself primarily with this Battalions part in the ensuing action. Many details regarding the layout of the Chateau’s defences, and, indeed, the overall sequence of events, have been omitted since these have often been described in stories of the heroic stand of the Foot Guards at Hougoumont, and are therefore presumed to be known. Colonel Frazer did not realize that in fact it was the Nassauers who had been exposed to the enemys hot fire., and who had kept the French from storming Hougoumont on its southern front. It is doubtful whether Wellington would have chosen a particular Nassau unit for the Hougoumont defence. The posting of the 1st Battalion, 2nd Nassau Regiment, might have come about for the simple reason that Captain Busgen, its commander, was the most junior of the Regiment’s battalion commanders. The prospect of having to fight among foreign troops, away from the Regiment’s munitions and other supplies and subordinate to unknown commanders, made this an undesirable assignment, to be handled by the officer lowest in seniority. This brief episode refers, of course, to the initial retreat of the Nassauers and Hanoverians from the orchard to the Hollow Way, before an overwhelming number of French attackers. While believed to be Belgians by the Russian commissioner, to Wellington they were Nassauers, all of them, even though there were also Hanoverians falling back with their German comrades. The uniforms of the Nassau troops and of the three Hanoverian units contained some shade of green, and looked non-British in other respects. They could easily have been mistaken for a single body of infantry. Count di Borgos sparse anecdote indicates that the Duke and his companion observed the events at Hougoumont from a distance, and that Wellington’s reaction was confined to his sarcastic remark. Most notably, he himself confirmed its authenticity to a third party, Sir John Malcolm. Absent is the high drama from later tales of the Nassauers alleged infamous conduct. The tone of Wellingtons remark leaves no doubt that, for some reason, he was not too well-disposed towards the retreating troops. A clue to Wellington’s displeasure may be found in the positioning of the Nassau contingent in the Chateau area. He apparently had not been informed of the fact that, around ten o’clock in the morning, his British Guards had been told to hand over the main defence positions—the buildings, the garden, and the orchard— to the Nassau Battalion.49 On an inspection ride with his Military Secretary, Lieutenant-Colonel Lord Fitzroy Somerset, he met the light companies of the 1st Guards on their way from the orchard to the main line. When discovering from their Commander, Lieutenant-Colonel Lord Saltoun, the ordered replacement of his units by the Nassauers, Wellington expressed surprise, and said he was not aware of such an order.50 Apparently, his own plans had called for the Nassau Battalion to take up position in the wood and adjoining terrain in front of Hougoumont, and not in the Chateau complex itself. Considering Wellingtons well-known resentment of any independent action by subordinate commanders, he would hardly have tolerated the peremptory dislodg­ing, by a junior officer, of his British Guards from their original defence positions at the Chateau. The Princes higher social rank and the pressure of events may have kept the Duke from taking further action. It seems, however, that he vented his irritation over the affront on the hapless Nassauers. Upon seeing them driven out of the orchard, his sarcastic remark had that extra edge of personal resentment: Voila des coquins! On more than one occasion, Wellington had been faced with some of his troops taking to their heels. Quatre Bras had seen such incidents. Why he so enduringly remembered the brief and, for the outcome of the action, inconsequential retreat of part of the Nassau Battalion from the Hougoumont orchard, may at least in part be explained by its unplanned and unexpected displacement of his Guards at the Chateau, on the morning of Waterloo. Why the firing at him by his own troops remained a topic in the Dukes conversa­tions over the years must stay a matter of speculation. At Waterloo he was exposed to a hail of bullets and artillery projectiles. He survived this unscathed while left and right of him staff officers and adjutants were killed or wounded. But this kind of danger was impersonal, and not the stuff of anecdotes. The theme of soldiers from a friendly force taking aim at him offered a more acute and dramatic illustration of the dangers that he had personally faced. It also led his listeners to contemplate once again the Dukes key role at a turning point of history, and the consequences for Europe had one of those fellows been a better shot. But considering the Dukes obvious ill-feeling towards the Nassau troops at Hougoumont, it was little wonder that they figured prominently in the stories of his exposure to friendly fire. To his listeners, their alleged behaviour provided a prime example of the kind of troops in his infamous army with whom he had to win the Battle. If true, the following incident might have reinforced Wellington’s suspicions of their trustworthiness. all our expectations, and injured the cause of Europe more than did the whole efforts of Napoleon and his army. But whatever the circumstances that led to the tales of trigger-happy Nassauers, coming from the Duke himself they gained the status of historical fact, and were preserved as such by eminent biographers of Wellington and historians of the Great Battle. ‘We were a great part of the time,’ he [Count Pozzo di Borgo] said, ‘between the two armies, but the coolness of the Duke,’ he added, ‘is not to be described. Considerable troops of Belgians [sic] stationed at Hougou­mont gave way. The Duke, turning to me, said, smiling, “Voila des coquins avec qui il faut gagner une bataille”.’ I was so struck with this characteristic anecdote, that I went to the Duke, and asked him if it was true. He said Pozzo di Borgo had repeated his exact words. Malcolm, The Life and Correspondence of Major-General Sir John Malcolm, ed. J. W. Kaye (2 vols, London, 1856), ii, 102. He [Wellington] said he had not above sixteen or eighteen thousand British infantry at Waterloo; that he started with the very worst army that was ever got together; but that four or five regiments who had been in the Peninsula soon gave a tone and character to the whole army, and the result was known. The other troops under his command did very ill. The Nassaus ran away, and fired at him when he rode up to rally them. Henry John Temple, third Viscount Palmerston, Palmerston’s Journals, Selections from Private Journals of Tours in France in 1815 and 1818 (London, 1871), pp. 13-14. Now look here to the left of Hougoumont. Here the old Regt of Nassau troops ran away; & I went to meet them & rally them, & by God they were so frightened, they fired upon us. The Conversations of the First Duke of Wellington with George William Chad, ed. the seventh Duke of Wellington (Cambridge, 1956), p. 4. Very early in the day the Nassau Brigade were shifting their ground from an orchard; and when I remonstrated with them, they said in their excuse that the French were in such force near them. It was of no purpose that I pointed to our Guards on the right. It would not do; and so bewildered were they, that they sent a few shots after me as I rode off. ‘And with these men,’ I said to the Corps Diplomatique who were with me, ‘And with these men I am to win the battle.’ They shrugged their shoulders. How did they behave in the action? Well enough; and it should be remembered that, as they had never served with us, we had not acquired their confidence. They had come over to us at Bayonne, having formed the rear-guard of the French army in Spain; and knowing as they now did, that Bonaparte was in the field, their dread of him must have borne some proportion to the courage with which he had formerly inspired them. Samuel Rogers, Recollections by Samuel Rogers, ed. W. Sharpe (Boston, 1859), pp. 233-4. Francis, first Earl of Ellesmere, Personal Reminiscences of the Duke of Wellington, ed. Alice, Countess of Stafford (London, 1903), p. 157. Philip Henry, fifth Earl of Stanhope, Notes of Conversations with the Duke of Wellington 1831-1851 (World’s Classics edn, Oxford, 1938), p. 221. 1 George Hooper, Waterloo (London, 1862), p. 189. 2 Jac Weller, Wellington at Waterloo (New York, 1967), p. 88. 3 Maj. Moritz Büsgen, ‘Relation liber den Antheil welchen das 1. Bataillon das Herzoglichen 2. Regiments an dem Tage des 18ten Juni wahrend seiner Detachirung vom Regiment an der Schlacht von Waterloo genommen hat’ (Report on the Participation of the 1st Bn of the 2nd Ducal Regiment on 18 June in the Battle of Waterloo during its detachment from the Regiment), MS. No. 202/1015, Hessisches Hauptstaatsarchiv Wiesbaden [Büsgen MS.]. The ‘Relation’, dated 17 Dec. 1835, had been requested by the Nassau Generalcommando and was apparently to be used in a summary report on the part of the Nassau troops in the Battle of Waterloo. The latter report, prepared by Maj-Gen. von Kruse and dated 7 Jan. 1836, was sent to the Hanoverian Capt. Benne, who had made a request for it on behalf of the British Commander-in-Chief. This report may be identical with a report on the Nassauers carrying the hand-written comment ‘From an unknown K.G.L. Officer’ among William Siborne’s unpublished materials. See D. Hamilton-Williams, ‘Captain William Siborne’, JSAHR 66 (1988), 78. 4 ‘Report of the 1st Hanoverian Brigade’, in Julius von Pflugk-Harttung (ed. ), Belle Alliance— Verbundetes Heer (Berlin, 1915), p. 77. The editor had collected documents from archives of German states whose troops had participated at Waterloo in Wellington’s Army. 6 W. Siborne, The Waterloo Campaign 1815 (4th edn, Birmingham, 1894), p. 374. 9 J. Paget and D. Saunders, Hougoumont (London, 1992), p. 31. 10 Weller, Wellington at Waterloo, p. 88. 11 Hooper, Waterloo, p. 192. 12 D. MacKinnon, Origin and Services of the Coldstream Guards (2 vols, London, 1833), ii, 215. The author is grateful to Philip Haythornthwaite for information on this source and for other valu­able suggestions relating to the action at Hougoumont. 14 Cited in P. Wacker, Das herzoglich-nassauische Militar 1813-1816 (Taunusstein, 1998), p. 118. 15 MacKinnon, Services of the Coldstream Guards, ii, 216. 16 H. Houssaye, 1815 Waterloo (London, 1900), p. 188. 17 P. Haythornthwaite, Die Hard! (London, 1996), p. 221. 18 Paget and Saunders, Hougoumont, pp. 39 and 50. 19 E. Cotton, ,4 Voice from Waterloo (Brussels, 1849), p. 48. 20 Wacker, Das herzoglich-nassauische Militar, p. 125. 21 Siborne, Waterloo Campaign, p. 379. 22 Cited in D. Hamilton-Williams, Waterloo—New Perspectives (New York, 1994), p. 279. 23 Paget and Saunders, Hougoumont, pp. 39 and 100. 26 Cotton, Voice from Waterloo, p. 48. 27 Paget and Saunders, Hougoumont, p. 41. 30 Siborne, Waterloo Campaign, p. 459. Nassau Regiment. See P. Wacker, Herzogtum Nassau, Infanterie-Fahnen 1806-1866 (Berlin, 1968). 33 Siborne, Waterloo Campaign, pp. 486-7; Cotton, Voice from Waterloo, p. 99; Hooper, Waterloo, p. 227. A. G. J. Chalfont (New York, 1980), p. 88; Paget and Saunders, Hougoumont, p. 40. 35 Cited in Francis, first Earl of Ellesmere, Personal Reminiscences of the Duke of Wellington, ed. Alice, Countess of Stafford (London, 1903), p. 207. 36 Büsgen MS.; Schmidtborn, Antheil der Herzoglich-Nassauischen Truppen, p. 25. 37 W. Isenbart, Geschichte des Herzoglich Nassauischen 2. Infanterie Regiments (Berlin, 1903), p. 158. 39 Wacker, Das herzoglich-nassauische Militdr, pp. 126-7. 41 Weller, Wellington at Waterloo, p. 79 n. 2. 42 Ellesmere, Personal Reminiscences, p. 157. 1831-1851 (Oxford, 1938), p. 221. 45 Ellesmere, Personal Reminiscences, pp. 183-4. 47 Wacker, Das herzoglich-nassauische Militdr, pp. 903 465. 48 J. Malcolm, The Life and Correspondence of Major-General Sir John Malcolm (2 vols, London, 1856), ii, 102. 50 ‘Paget and Saunders, Hougoumont, pp. 31-2. 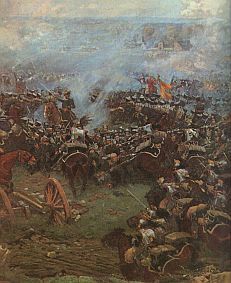 51 D. Boulger, The Belgians at Waterloo (London, 1901), App. p. 60. 52 Boulger, Belgians at Waterloo, p. 65. 54 Pflugk-Harttung, Belle Alliance, p. 205. 55 The Diary of Frances Lady Shelley 1787-1817, ed. Richard Edgcumbe (London, 1912), pp. 96-7. Wellington was probably aware that Prince Wilhelm of Nassau-Weilburg on his staff was a close friend of Lady Shelley, and may have felt it unwise to blame her friend’s countrymen for the abject deed. In later years she reminisced about the Prince’s ‘chivalrous devotion—for he was in those days [July 1815] my most active attendant’. See The Diary of Frances Lady Shelley 1818-1873, ed. Richard Edgcumbe (London, 1913), p. 322. 56 Cotton, Voice from Waterloo, pp. 255-6. The troops belonged to the 1st Nassau Regt which fought in Lt-Gen. Allen’s 3rd Division sector. Their commander ordered the white covers removed from the caps at about 3 o’clock because they seemed to attract the enemy’s fire. See Wacker, Das herzoglich-nassauische Militar, pp. 132-3.